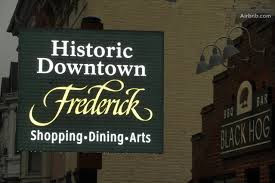 Here is the City of Frederick, MD's, eNewsletter for July 2018. It has been reposted here by permission. If you have any questions or suggestions, direct them to Patti Mullens, the city's Public Information Coordinator, and author of the newsletter: pmullins@cityoffrederick.com. The topics for this month's newsletter are shown below and the articles follow. Stay Informed by Watching City Cable Channel 99 for the latest City news! 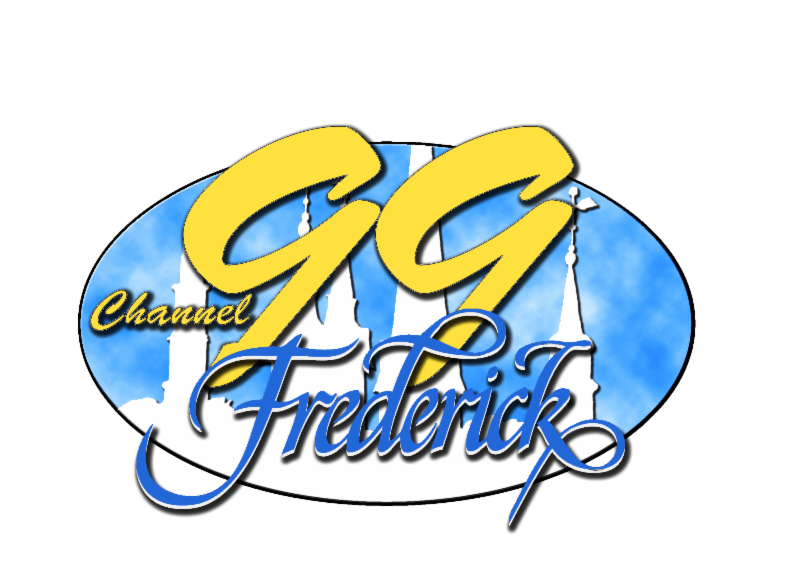 Click on the links below to view the following videos produced by The City of Frederick's Audio Visual Department. Free live entertainment for the family comes to the stage every week in Celebrate's 2018 Summerfest Family Theatre, Sunday concerts and July 4 spectacular. Enjoy free children's entertainment featuring local, regional and national performers showcasing the best in tot rock! Summerfest Theatre schedule at https://www.celebratefrederick.com/events/. From jazz and reggae groups to outstanding tribute artists, the free concert series has something for everyone! 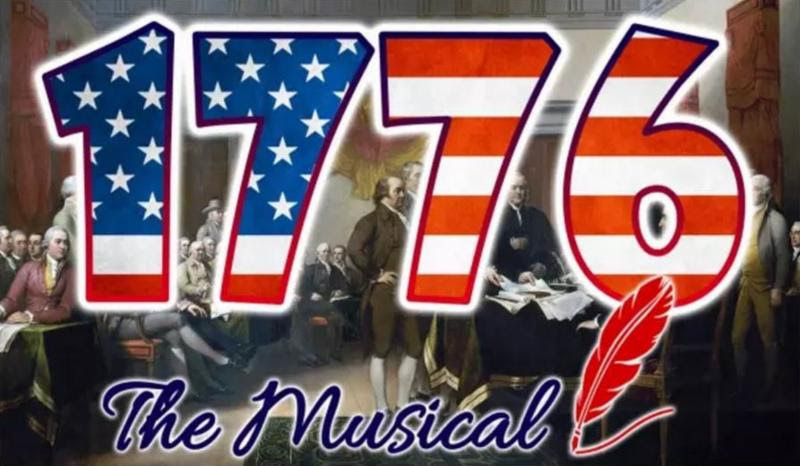 Join us for the largest Independence Day celebration in Frederick County! Enjoy non-stop children's activities, a volleyball tournament, and fabulous local food and beers. Two stages of live entertainment will keep the park rocking throughout the day into a spectacular fireworks display which will fill the skies above Baker Park at dusk. Fourth of July schedule of events at https://www.celebratefrederick.com/events/. Featuring a cast of professional actors and special guest cameo appearances by Mayor O'Connor and other local civic leaders! July 7: First Saturday!, celebrates the City's vibrant visual and performing arts scene. Downtown, the first Saturday of every month means all-day activities, late-night shopping and dining, live music. First Saturdays are a great time to discover something new about Downtown Frederick. Every Thursday, May-September: Enjoy happy hour + live music on Carroll Creek in downtown Frederick. 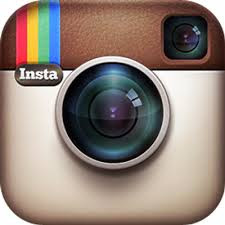 Visit the downttownfrederick.org website for more information. 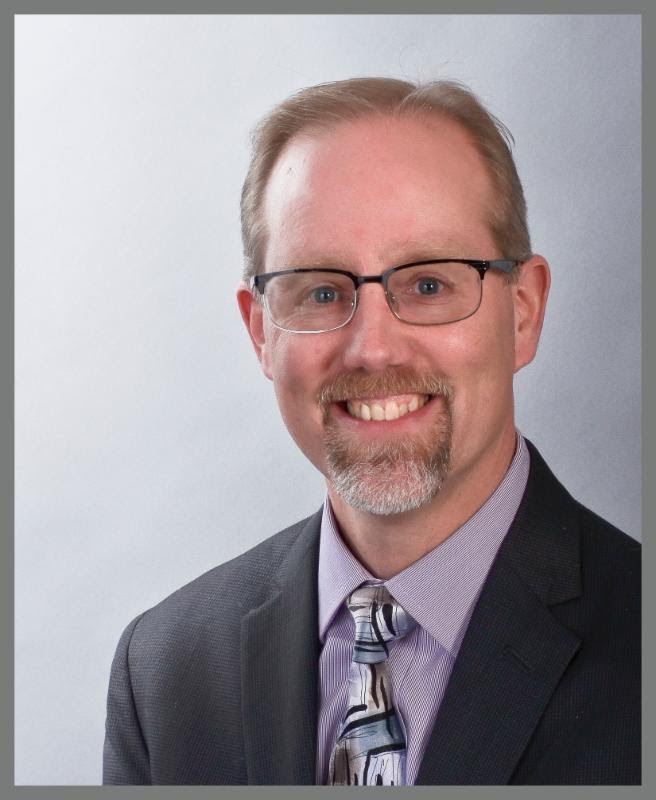 Mayor Michael O'Connor has scheduled his next public information and media briefing to provide updates on projects and major strategic initiatives, including the completed audio visual control room renovation. The briefing will be broadcast live on City cable channel 99 and streamed via Granicus at www.cityoffrederick.com. The public is invited to attend. During the town hall, the mayor and emergency management personnel will discuss damage to public property from May flooding, recovery assistance for private property owners and strategic planning. 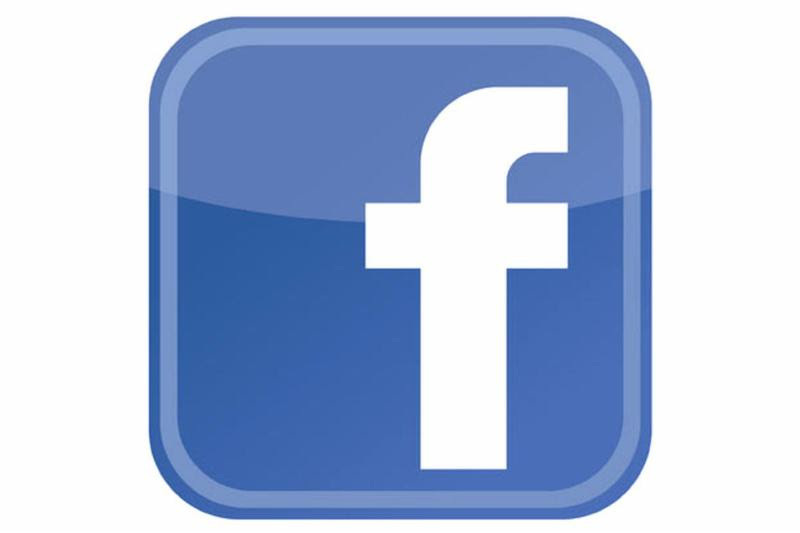 The meeting will be broadcast live on City cable channel 99 and streamed via Granicus at www.cityoffrederick.com. The public is invited to attend. Frederick youth are invited to serve on the new Youth Advisory Council that the Board of Aldermen voted unanimously to create earlier this year. The council will consist of 18 total members, 13 voting and five non-voting. Youth may apply to serve on the council online (www.cityoffrederick.com/yac), and/or by sending letters of interest to Bob Smith, deputy director of Parks and Recreation, at 121 N. Bentz St., Frederick, MD 21701. The Mayor and Board hope to select the first council by September. The Information Technology (IT) Department has completely redesigned the free iSpires app, now enabling "push notifications" from the City. Now, the City will also be able to send important messages through the app. Get the free app from the Apple App Store, search iSpires; or download it here. The android release will come in the next month. "This latest version of the iSpires app continues to have all the features citizens routinely use to interact with the City," said Mayor Michael O'Connor. "Adding a way to communicate with residents through the app increases opportunities for citizen engagement." The Maryland Department of Commerce announced the designation of a new enterprise zone along the Route 40 corridor known as the "Golden Mile." The Maryland Enterprise Zone Program is an economic development program established by the Maryland General Assembly that offers real property and state income tax credits in return for job creation and capital investments in targeted areas. 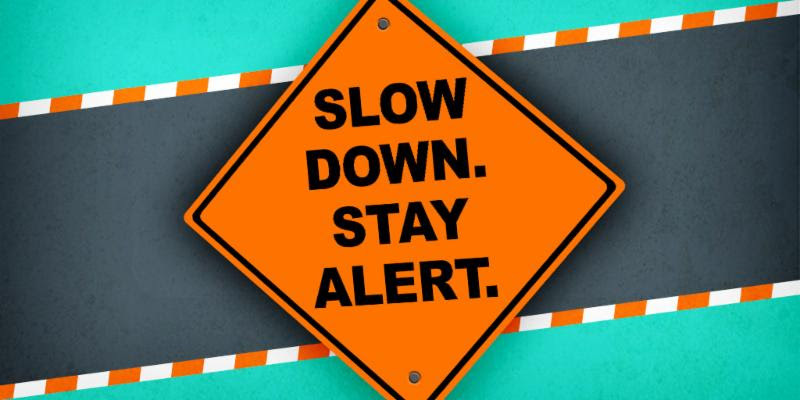 To keep citizens informed about existing and planned road closures, The City of Frederick is now posting those details on the Maryland Department of Transportation road closure map, which gives users a bigger picture of road closures in general. 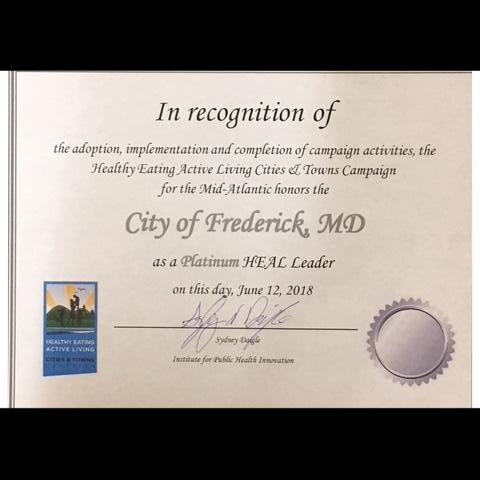 For healthy living initiatives, The City of Frederick was promoted to a platinum level HEAL leader during the Maryland Municipal League Summer Conference. Baker Park hosts the largest Independence Day celebration in Frederick County: Non-stop children's activities, a volleyball tournament, and fabulous local food and beers. Two stages of live entertainment will keep the park rocking throughout the day into a spectacular fireworks display which will fill the skies above Baker Park at dusk. Fridays through Oct. 26, 10 a.m.-2 p.m. The Food and Farm Market will feature food trucks and locally sourced goods at the William Talley Recreation Center area of Baker Park, every Friday between 10 a.m. and 1 p.m.; food trucks until 2 p.m.
For additional program information, call 301-600-1492. 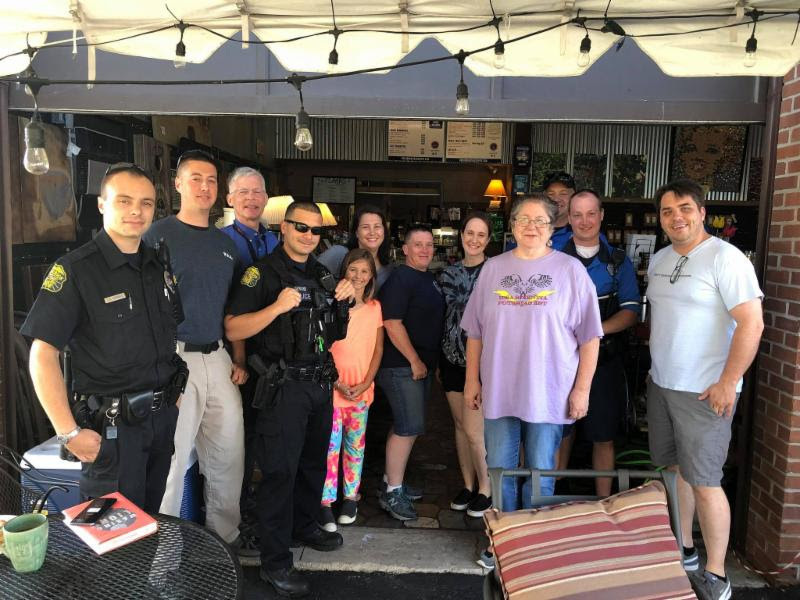 Frederick Police partnered with The Frederick Center to host Coffee with a Cop on June 25 (above) at Dublin Roasters. National Night Out - Police and Neighborhood Advisory Councils are planning for the family fun, food, dance, games for Aug. 7 National Night Out festivities, 7-9 p.m. The Neighborhood Advisory Council Initiative, also known as NAC, is a forum for residents to become involved in identifying and recommending changes to improve their neighborhoods. Each NAC meets to discuss issues, concerns and neighborhood projects. 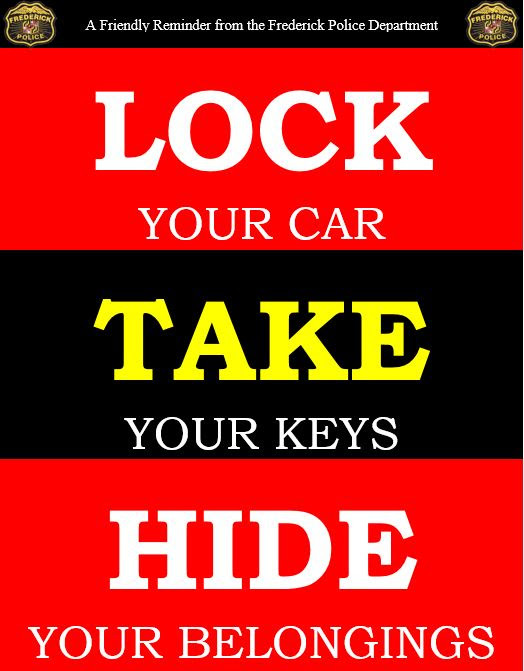 Find your NAC on the website: http://www.cityoffrederick.com/. July 16 @ 7 p.m., NAC 10, Burck Street Community Center, 413 Burck St. 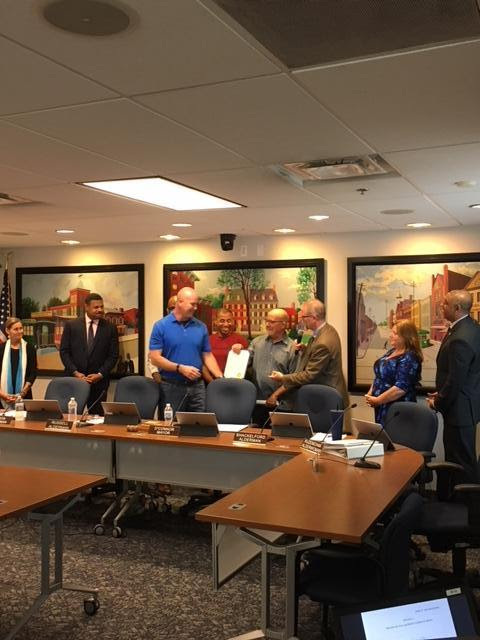 The City of Frederick values diversity in its workforce and is an equal opportunity employer. 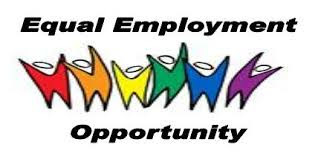 For information on employment with The City, visit Job Opportunities & How to Apply. Applications and current job descriptions are also available inside City Hall by the security desk on the first floor.